After suffering a blowout loss at Y-D on Sunday, the Chatham Anglers (10-10-2) will return home Monday to face the Orleans Firebirds (9-13-1) at Veterans Field. Chatham sits in third place in the East Division standings while Orleans is in fourth, four points behind the A’s. Chatham’s last five games have highlighted the offensive inconsistencies it has dealt with all season. Masked by three games scoring one run or less are 13-run and 9-run outings against the Harwich Mariners on July 3 and 7. The Anglers were on the wrong end of two 3-0 shutout losses to the Firebirds in a home-and-home series on July 4 and 5. On Independence Day, neither team scored a run until Orleans logged three in the top of the ninth. Jeff Belge ranks third in the league in strikeouts with 24. A day later, the Firebirds scored three runs in the bottom of the third for the only runs of the contest. The A’s tallied eight hits in the two games combined, their lowest two-game output of the season. 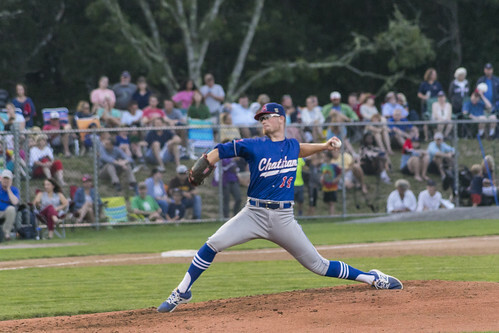 Chatham’s pitching staff was stellar over the 18-inning span, recording 16 scoreless frames and 17 strikeouts. Its only hiccups came in Orleans’ two three-run innings. Jeff Belge (St. John’s) will make his second start and fifth appearance on the bump of the summer. The second-year Anglers player has logged more innings (17) and strikeouts (24) than any other Chatham pitcher this season. The left-hander has lasted four frames or more in each of his outings, only one of which came in a win. Once Belge’s day ends, John McMillon (Texas Tech) is expected to come out of the bullpen. McMillon’s only pitching appearance came in the Anglers’ July 5 loss at Orleans. The right-hander tossed two innings of scoreless ball and struck out two. In three of its last four games, Chatham’s achilles heel has been one bad inning. In both games against the Firebirds, it was a three-run inning. Sunday at Y-D, a disastrous nine-run fourth inning put the Anglers in an insurmountable hole. In the three defeats, the A’s staff has allowed a run in four of 27 innings.